Pea flour is produced for yellow field peas that are roasted prior to milling. Roasting increases nutritive value of protein and starch. 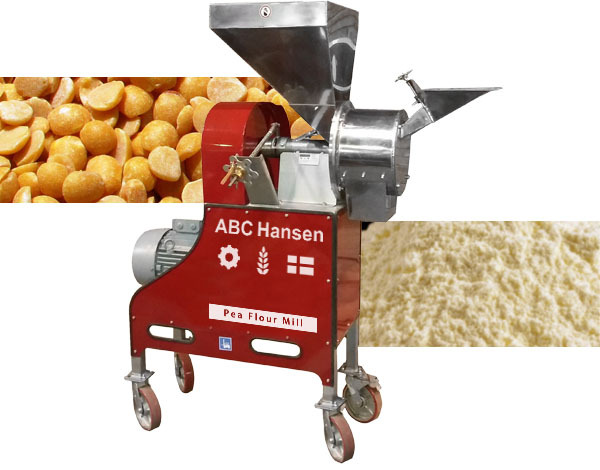 Pea flour has traditionally been milled on stone mills and thanks to the ABC Hansen stone mill program, can still be processed today to the same high standards. Pea flour is normally brownish in colour due to the caramelization achieved during roasting. Pea flour can range between very fine and gritty and is eaten as brose in Scotland by adding boiling water to the meal and then adding butter, pepper, salt, sugar or raisins. Pea flour is also used in hummus dishes. Pea flour stone or plate milled with ABC Hansen’s Universal mill or stone mill, can be processed into products like muffins, flatbread, green pea gluten-free flour breads, bundt cakes, pea flour tagliatelle, pea flour crepes and many other products. Universal mills are made in stainless steel and chrome plated, contact parts. It is always recommended that products be screened on an ABC Hansen rotary sifter prior to packaging for quality purposes if not for grading or separation purposes.